In the Add or Remove Snap-ins dialog box click Group Policy Object Editor and then click Add. Click This computer to edit the Local Group Policy object. Open the Local Computer Policy. Double click on the Require additonal authentication at startup policy. Change the setting to Enabled and then click OK. This will force the pin option then ask you to specify a key. When you manage Bitlocker settings the reset PIN option will be available. Do I need the System Reserved Partition when I install Windows? When you install Windows 7 or Windows 8 and do not manually create a new partition, a small System Reserved partition is automatically created. The size of this partition is 100MB for Windows 7 and 350MB for Windows 8. This partition contains critical boot files such as the Boot Configuration Database (BCD). While it is possible to install Windows without a system reserved partition (for example, by manually specifying a single partition that fills the entire disk), whereby the boot files reside in the single partition, this is not recommended. Without a system reserved partition advanced features such as Bitlocker drive encryption are not available. Can I remove the system reserved partition after installation? No. Removing the system reserved partition after installation will leave you with an unbootable system. Note: When you have installed Windows with a system reserved partition present, it is normal for Windows not to assign a drive letter to it. We do not recommend that you assign a drive letter to the system reserved partition. I am Running NetIntelligence and Want to Upgrade to Windows 10. Will this Work? NetIntelligence is not yet compatible with Windows 10. If you upgrade to Windows 10 you will find that the internet filtering stops working. Recommendation: If you have NetIntelligence installed we recommend that you wait on upgrading to Windows 10. This article will be updated when there is a version of NetIntelligence that solves this problem. All systems running NetIntelligence web filtering. I created a Windows image with the BIOS configured to IDE mode. How can I move to an AHCI system? Your development system has the SATA hard drive controller mode configured as "IDE"
When you try and deploy the image, the system blue screens on bootup. You use the "Disable restart on System failure" option which allows you to see that the blue screen code is "0x0000007b - Inaccessible boot device"
The Windows AHCI driver is not left enabled when the system is installed on a system using an IDE controller. When you then boot the image on the AHCI system, the system does not have an AHCI driver enabled, so the system cannot boot. Highlight ChildCompletion and on the right you will see "setup.exe"
Double click "setup.exe" and verify the value is set to "1"
Change the value to "3"
Close the registry editor and close the command prompt. Click OK on the error message and now the installation process should complete. Deployments of Windows 7 using SCCM 2012. Should I use Windows 10 x86 (32-bit) or x64 (64-bit)? Windows 10 x86 (32-bit) is limited to using 4GB of RAM or less on PCs. Windows 10 x64 (64-bit) can use more than 4GB of RAM and it does this by using the AMD64 standard for 64-bit instructions. This needs the system to be able to support 64bit. Using 64-bit Windows future proofs your machine as much as possible, even if you have 4GB of RAM or less at the moment. As long as you have at least 2GB of RAM (recommended), and the right processor, you can use Windows 10 x64. Do All Machines Support Windows 64-bit? No. Some older machines might not support 64-bit Windows, although most machines manufactured from 2006 support at least one version of Windows 64-bit. If you are having problems with 64-bit Windows, see if there is an updated BIOS for your machine. Also, some low-powered netbooks or small notebooks might not support 64bit Windows. They might be limited to Windows 8.1 x86, with some of them upgradeable to Windows 10 x86. Even if your machine support Windows 64-bit, for example Windows XP 64bit, or Windows Vista 64-bit, there may not be drivers available for your hardware for Windows 10, in either 32-bit or 64-bit versions. Isn't it just Safer just to use Windows 10 x86? This is where you need to check what your machines support. Some of the latest PCs don't support Windows 10 x86, including machines based on the H81, B85 or Q87 chipset. Whilst you might be able to install Windows, you might find that some device drivers aren't available, or don't work properly - for example, the video display driver might not be available. Use the Stone Driver Finder to check to see if Windows 10 64-bit drivers are available for your machine. Is Windows 64bit Faster than 32-bit? Not necessarily. However, the benefit of being able to access and use more RAM memory can make your system faster overall. Additionally, some programs are available in specific 64-bit versions. Again these might be able to make use or more RAM and thus run faster, or benefit from small improvements by using the 64-bit instruction set. What if I am Using Windows 7 32bit and I want to Upgrade to Windows 10? In this situation, most Windows 7 licenses can be upgraded from 32-bit Windows 7 to 64bit Windows 10, as most Windows 7 licenses aren't locked to being used with 32-bit or 64bit. However, you need to upgrade to the same family of Windows. If you have 32-bit Windows 7 and want to upgrade to Windows 10 64bit, you won't be able to do do an upgrade installation. You will need to download the 1511 or later version of Windows 10 64bit. This allows you to do a fresh install of Windows 10, but allows the system to be activated based on the previous Windows 7 activation. Microsoft do this by tracking the unique hardware signature of your machine, mainly based on the motherboard universal ID, or UUID. Can I do the Free Upgrade to Windows 10 at any Time? The facility for a free upgrade ends on July 28th 2016. After that time, free upgrades from Windows 7 or Windows 8 will not be possible. How Can I tell if I am Running x86 or x64? From inside Windows 7,click on Start, then right hand click Computer. Then left click on Properties. 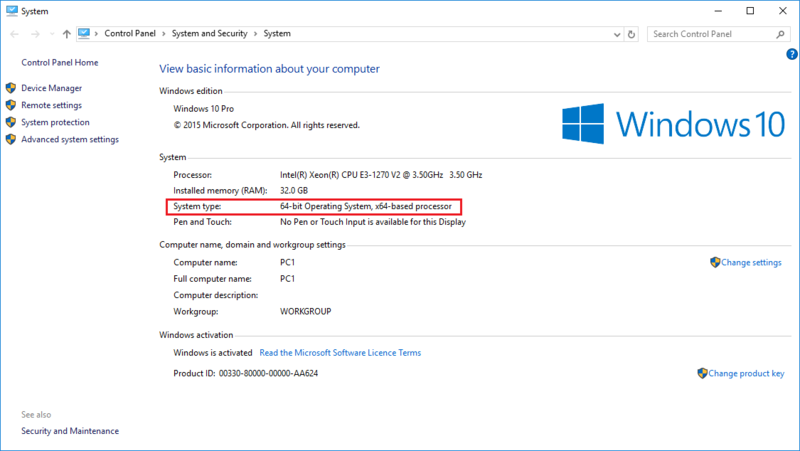 Look at the "System Type" to see if you have a 64-bit Operating System. From inside Windows 10, right hand click on the Start Symbol (usually at the bottom left hand corner of the screen) and then click on System. Look at the "System Type" to see if you have a 64-bit Operating System. What Should I do Before Trying to Upgrade to Windows 10? 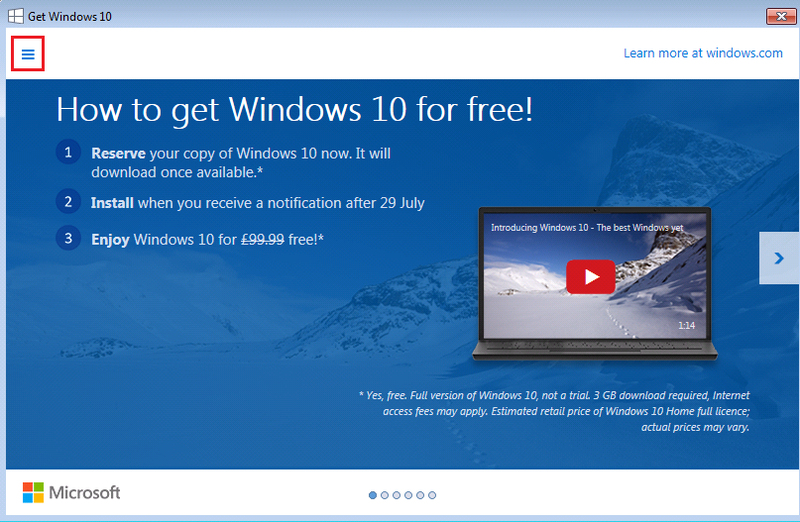 Windows 10 has just been released and many customers are looking to try out the new features. We've written a short list of things to do below to help it go smoothly. ​Please contact Support if you have any questions about this process. Reserve your copy of Windows 10 by following these instructions here. If you don't have the little Windows 10 upgrade icon in the system tray, you might need to install this update if you are running Windows 7 or Windows 8.1. The update should appear as an important update to Windows, in the list of Windows Updates. If you are running Windows 8 (not 8.1) you will need to upgrade to Windows 8.1 first. Note: If you are running Windows 7 Enterprise or Windows 8.1 Enterprise, you will not get the Windows 10 upgrade icon in the system tray. Please speak to your IT administrator or your Stone account manager regarding Windows enterprise upgrades. Upgrades to Windows 10 are not currently available for Windows RT users. 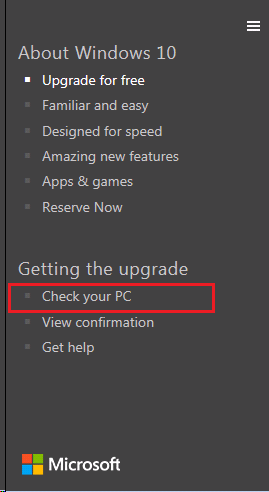 When going through the reservation process, use the Check your PC option to check your PC for compatibility. This doesn't 100% guarantee that your system can run Windows 10, but it should point out any major issues. Or alternatively, right hand click on the Windows 10 upgrade icon, and then click on Check compatibility status. Then click on the Menu button on the top left. Then finally click on Check my PC. 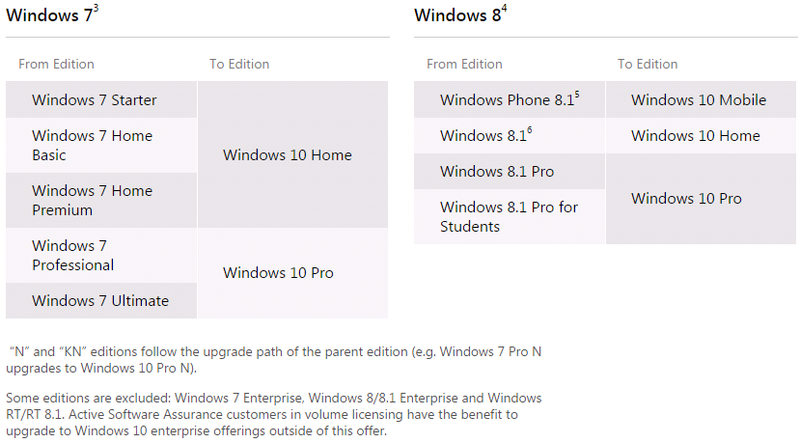 Windows 10 has a revised number of editions. We recommend you see which version you will be upgraded to. Most customers will be upgraded to a version with more features than their previous edition. Have a look at the chart below, or see here. Windows 10 should be able to upgrade Windows 7 or Windows 8.1 to Windows 10 and leave all of your documents, music, pictures and videos etc. in place. However, it is always a good idea to have a full backup of anything important before making major changes to your system. We recommend that you backup your files to a network location, to a USB pen drive / external hard drive, or the cloud. Note: We don't recommend the use of Windows Backup as the program to make backups before upgrading to Windows 10, as you will not be easily able to restore the files in Windows 10, if at all. As we become aware of any compatibility issues we will post them in our new Windows 10 section of the Stone Knowledgebase, here. Most drivers will be automatically available, either as part of Windows 10, or from Windows update. Some Stone specific applications though will not be available from Microsoft, so we recommend that you check the Stone Driver Finder for Windows 10 support for your model or serial number. Download Windows 10 versions of Stone specific applications, such as the NT310 Hotkey utility, before attempting the upgrade by using the Stone Driver Finder. See miore advice here. Check that your peripherals - especially printers, scanners and cameras - are compatibile with Windows 10. Uninstall Windows 7 specific Stone software such as the Hotkey utility, before attempting the upgrade. Check that your anti-virus or internet security software is compatible with Windows 10. If in doubt, uninstall if before attempting the upgrade, and reinstall it afterwards. Always run Windows Update and check for Optional updates too after doing the upgrade, to update the main drivers. Install new versions of the Hotkey software once the upgrade is complete. All Systems running Windows 7 non-Enterprise or Windows 8.1 non-Enterprise. Where is my Windows 8 Product Key or COA? Microsoft made an improvement to its activation process in Windows 8 meaning all machines built with this operating system installed no longer have a COA label affixed to them. A digital key is incorporated into the BIOS of the machine by Stone Computers in the factory. You can still see that your machine is licensed for Windows 8 by the small logo label, usually affixed underneath your machine if your machine is a notebook. Do you wish to install your own Anti-Virus / Anti-Malware protection on a Windows 8 machine? With Windows 8, Microsoft have integrated Microsoft Security Essentials with Windows Defender, and it comes preinstalled with Windows 8. 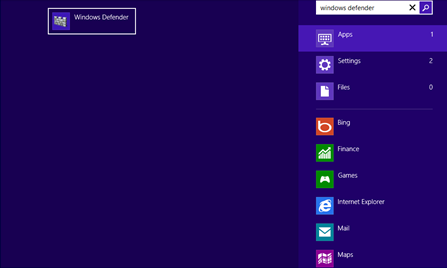 Windows Defender provides a basic but adequate level of cover in keeping your computer protected. If you wish to install a different anti-virus product you first need to disable Windows Defender. Some antivirus products may do this automatically. If you experience any problems with the third party anti-virus, use the steps below to ensure that Windows Defender is disabled. You then need to click on the Windows Defender program. This will then open the application on the desktop. Then go to the Settings Tab, and then find the Administrator option on the left hand side. 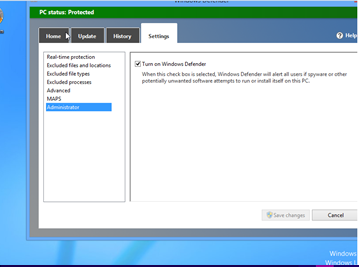 Untick the Turn on Windows Defender option to disable Windows Defender. If you turn off Windows Defender before you install the third party antivirus product you will get a warning prompt in the Action Center that Spyware and Virus protection is turned off. This warning will disappear when you install the third party product.